Monkey crossed the rainbow bridge today surrounded by many that have cared for him and loved him these past 6 months. As sad as we are, we are grateful that he had a lovely retirement from life as a street/beach dog and was able enjoy his final months with loads of food, water, medical care, soft beds, shade, love and all the other things that an amazing foster home can provide. He was rescued on January 4, 2018. We had been contacted about a dog in great need and although the person wasn’t able to foster him, she was able to provide all the financial support needed so that we could stretch ourselves a bit too thin once again and help a desperate case. Monkey was a well-known beach dog in Punta de Mita. He had people that cared for him as they could, but some of the basics simply couldn’t be managed. Love, there was lots of love, but it isn’t always enough. The day that Monkey was rescued, we also took in his friend Pirata. They were both on the brink and we are grateful that we got to them when we did. Pirata was much younger & after many months in care recovered fully. Monkey was an old dude. He wasn’t in the position to be adopted to a family and he simply needed a great retirement home. Thankfully, the amazing people from LADRA opened their arms and their hearts to take in this senior boy. He had been cruising along until yesterday when he had a small fall, a slip. It didn’t seem like much at the time, but he didn’t want to get up afterwards. There were lots of cuddles, a soft bed and cajoling. There was roasted chicken and all of his favorites were offered, but he simply decided it was time. There was no specific injury, but he didn’t want to lift his head, he didn’t want to eat, or drink water. He clearly let us know that he was ready and we helped him along his way. Run free now lovely pup. You were a great dog Monkey and there were so many that loved you. We know you are at peace and no longer living restricted by age and those old joints. We are grateful we got to know you and thankful to have been a part of your journey. Rest well sweet Monkey, rest well. ​Hilary spent her winters in Mexico and volunteered to help the animals in need. In the winter of 2015, she came across a beautiful, gentle pup that really needed her help. When the time came for Hilary to return to Canada, she simply couldn't put Brando back on the streets. Even though she didn’t have a long-term plan, she flew Brando with her to the interior of BC. Hilary loved Brando, but knew he needed more than she could give him. Torrance, Hilary's daughter, contacted Mexpup for help, and of course we said yes. Brando was screened by a vet and started on a few treatments to get him ready for adoption. Time passed and although Brando was improving, his bloodwork wasn’t responding the way we expected. Not long after that it became clear that something was seriously wrong. A tumor started to develop and we realized he had TVT. We began the course of treatment needed, but after six rounds of chemo, we sadly realized that the aggressive tumors were only getting worse. Vets in Mexico with much experience with this disease were consulted, options were discussed, and it was agreed that there was nothing more that could be done to stop the progress of the tumors. It was decided that we would give him the best life possible in the time he had left. Kristi has loved and fostered Brando since he arrived in Victoria, she is his family and we are so grateful to our amazing foster families. Sadly, today we had to set him free. His life was not what we had hoped for, but he knew he was loved and had a family. Hilary, Brando’s rescuer, passed away suddenly 3 weeks ago. We know that she is at the bridge waiting for him. Thank you Hilary and Torrance for giving Brando his chance. Thank you to our amazing vets at Saseenos for trying to save Brando and keeping him comfortable so that he could enjoy his final months. Kristi, we are so grateful to you for taking him into your home, caring for him and loving him. You are and will always be his human. Brando, run free now sweet boy…you will be missed. ﻿​It is with heavy hearts that we share this news, today our dear sweet Osito Polar crossed the Rainbow Bridge. This special boy captured the hearts of so many near and far. He will be especially missed by his amazing long term foster family who gave him a wonderful life for the past 3 years against all odds and through many challenges. We are so grateful to Karen, Barry and Alana for all that they did for him. We are also grateful to all those that have donated to his care so that we could always make decisions based on what was best for him. Run free now little bean, you will be missed. There is a wonderful organization called PEACE Animals that runs the free spay & neuter clinics throughout Puerto Vallarta and the surrounding communities. During one clinic a couple arrived asking to euthanize one pup. 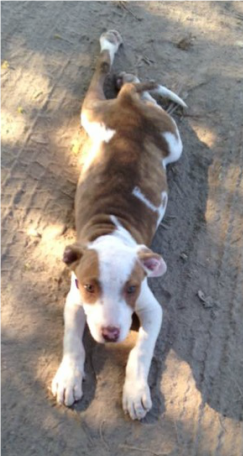 The paws of this puppy were deformed and the owners had come to the decision that he should be put down. The staff at the clinic didn’t want to comply with the request and asked the owners if they would surrender the dog. The couple agreed and so began the process of helping Osito Polar. Angeles returned to the clinic to pick up another rescue dog that had been neutered that day when she was asked if she could help. She agreed to foster the dog and MexPup took on the responsibility for the medical care and finding this special needs pup a good home. Osito was only 2.5 kilos when he was rescued (late March 2013). He got his name from his unique paws and the way he walked (sort of like a polar bear on ice). 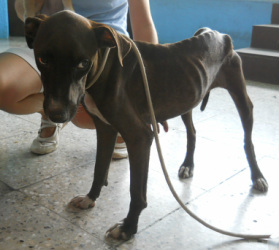 He was very weak, very anemic and suffering from ehrlichia. His physical deformities indicated that he might have additional challenges causing his recovery to take longer than what we normally experience. The good news is that with time and care he did begin to heal and became a happy, playful, devilish puppy who didn't realize that he ran or walked different than any other. We are still not certain what medical challenges he could face in the future but that doesn't diminish our commitment to him. Osito was fostered with Canito (now Bello) and they were simply a pair of playful pups who loved exploring, playing and doing was puppies do best…..looking adorable. Osito needs regular blood tests and veterinary care which in Canada is pricey. Please consider a monthly donation to his care. Update April 1, 2016: Tears for Lucio...he is gone. His body had suffered so much, more than we will ever understand. He was sleeping on bundle of towels when he passed. He was safe, he was warm, he was loved...it may have been for less than one day, but he didn't pass alone. This sweet boy is now running free without pain. We are so sorry that we couldn't do more, that we didn't find him sooner. We had great hope of a full recovery and a lovely life for him, instead there are simply tears. They were on the side of the road. There were no homes or buildings close by, so the guess it that they had been dumped there. It’s not something we will ever understand. Thankfully Maureen was driving by and noticed something that made her stop. She found 2 puppies that were about 7 weeks old and each weighed less than 2 kilos. They would have had no chance on their own. Instead they were put in the car, joined in on the road trip to Tonala, and then returned with Maureen to PV a few days later. Lily and Lucy were enjoying life in foster care. They seemed to be doing well, growing, and playing as puppies do. Sadly, things took a turn for the worse a few days ago. Puppies are fragile little creatures, so Maureen & John got Lily to the vets as soon as they noticed something wrong. This time, the parvo test was positive and Lily was now in grave danger. The vets did all they could, but Lily’s little body simply wasn’t strong enough to battle this horrible disease. She passed away after 1 month in foster care. Although her life was much shorter than we wanted, she passed knowing love and compassion. Her sister is still doing well and showing no signs of the illness. We will miss little Lily, and are grateful for all that loved her and helped her during her time with us. ​​Claudia, Enya & their pack were out for a Sunday walk when they saw a small pup in the middle of a dirt road. He was scared, very dirty, covered in poop, skinny with a huge tummy (parasites for sure), and a number of wounds on his head that appearred to be dog bites. 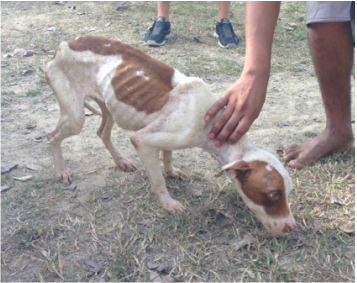 At about 2 months old and in horrible shape, he had no chance for survival on the street. Luckily for him, two wonderful animal rescuers found him. They picked him up, took him home, and that is how TommyRoo’s new life began. He was a loving pup who thrived in care. He loved going for walks and playing with the other dogs in his foster home. TommyRoo had a few medical challenges in the 3.5 months he was in foster care, but we dealt with them as they popped up. This past week he had a seizure. He had recently taken a new medication, so the belief was that he simply had a reaction to it, so that treatment was stopped. As the seizures continued, numerous efforts were made to keep them under control, and keep him out of pain. As the days passed, the seizures got worse and none of the treatments were helping. The vets advised us that TommyRoo had a neurological issue that wouldn’t improve, that he would continue to get worse, and that he was suffering. We took the difficult decision to stop his pain and helped him to cross over. TommyRoo was surrounded by his loving foster mom and the vets who had provided him wonderful care over these past months. We wish the outcome was different and that he would have grown up after being adopted into a wonderful home. We are grateful that although his life was short, he had a loving, caring foster home that did all they could for him. He knew love and compassion. Run fast and free TommyRoo, you were one sweet boy. It isn’t often that we don’t post a dog that is in dire need because we are too stunned. After shaking off the initial shock, we really didn’t believe there would be many bills and rather than upset all our supporters with the images, we simply focused on Jazzy. Well, days have passed and this amazing bright spirit has proven us wrong. She wants to stay around, we want her to stay around, and so we are now reaching out to you for help. Her bills continue to mount and we continue to support her during this fight. Jazzy still isn’t out of the woods yet but she is enjoying good food, good medical care and as much love as can be given. 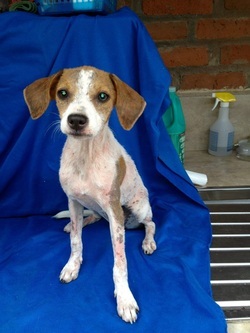 Please send your love, prayers, and energy to this beautiful girl and if you can help her with a donation that would also be appreciated (In Canada – etransfer to Karen@mexpup.com, in Mexico – donations at either Mascotas with Dr. Manuel or Sabuesos with Dr. Paco, or a paypal link can be found at www.mexpup.com). Jazzy’s story begins because of an email sent to Ted & Brischa from LADRA. Two women were on holiday in PV taking a group tour when they saw a dog in serious need. They wanted to help, they tried to help, but the location, the tour and everything kept that from being possible. They couldn’t forget the dog and looked for someone that could do something. Their cry for help was answered and the crew from LADRA went on a search for the dog. It took time, effort and patience, but Brischa and Dustin were finally able to locate this dog. They immediately understood why the women were so desperate to help her. In addition to being severely emaciated, Jazzy has two open wounds that go to the bone and they are infected. There are no words to describe the pain she must have felt and yet, this sweet girl was friendly and welcoming to strangers. They immediately got her to the vets and the prognosis wasn’t great. She was started on treatment with the plan to make sure that she knew safety, love and comfort no matter how much time she had left. Well, this little girl has shown us all a fighting spirit and love of life that is admirable. She hasn’t given up and is actually showing some improvement. The wounds have started to heal, her digestive system is improving and although there are steps backward, there are more steps forward. 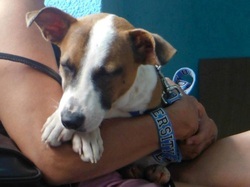 Jazzy is about 10 months old and weighed 9 kilos when taken into care. We don’t know what the future will hold for her, but we know that we will be there for her no matter what. We are heartbroken. We met Aileen in the worst of circumstances. We suspect she had been hit by a car as she was found on the side of a busy road with bone sticking out of her skin. Thankfully Kassandra found her, took her home and her grandmother cared for the pup until help was found. Once we got Aileen to the vets, it was confirmed that both her back legs were fractured, her body was fighting infection (likely caused by the exposed bone) along with ehrlichia, her platelets & red blood cells were dangerously low, and she was full of parasites. Even with all these challenges, Aileen would wag her tail every time we pet her or talked to her. This girl was the sweetest, happiest pup in the face of unimaginable pain. The first week we worked to get her stable enough for surgery to remove the infected leg. Her medical status improved each day and her joy remained. Then it was time for her potentially dangerous surgery and she made it through with flying colors. The day after surgery to amputate her right back leg, she was standing up while eating & drinking with her tail swinging wildly. That tail was an Aileen trademark showing her joy and spreading joy to all that saw it. Her other fractured back leg was already on the mend and things were looking up. Three days passed and then everything came crashing down. She passed away early this morning after complications from everything that she was battling. We are shattered. It is hard to explain how a little 8 kg, 9-month-old pup can crawl right into your heart and plant herself there, but that is what Aileen had done. Sometimes rescue is so cruel and just when you think the worst of battle is done it slaps you in the face. We will never forget you Aileen. You will always be in our hearts and we will never forget the images of that wildly wagging tail of yours. That we could all learn to remain joyous when suffering as you did, that would be an amazing gift. Run free sweet girl…we are sorry we couldn’t do more. Colette and Brischa were on the way to Bucerias to check on a group of dogs in need. While in route they saw a dog lying on the side of a busy road. He wasn’t in front of a home or a business and there wasn’t a break in the fence, so he seemed especially out of place. As soon as they stopped, they realized he was in trouble. It was difficult for him to walk due to the massive size of one of his testicles. It was larger than a grapefruit and there was no question he needed help. As it wasn’t an emergency, they loaded him in the car and continued on their way. When they got there, they found 4 well fed dogs with an owner that provided basic care for his animals, but who had limited resources for any extras. A plan was made to assist with spaying/neutering his dogs to prevent future litters and then it was time to get Kevin to the vets. There was no question that the mass needed to be removed ASAP and thankfully his blood work allowed the procedure to happen the very day. This sweet guy is about 10 years old and weighs 20 kilos. Kevin loves his new situation….food, water, love, a nice place to sleep and the ability to walk without the pain of the tumor. Kevin needed our help and we said yes. Now, we need your help. His bills are growing and at his age, we will need help caring for him for the rest of his life in care. Whatever happens, Kevin will be cared for, but we need your help to make sure that is possible. Please consider a monthly donation. This is second chance Gracie. 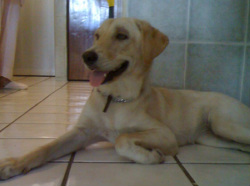 When Gracie was about 8 months old, Claudia, a MexPup volunteer and rescuer saw her being abused. 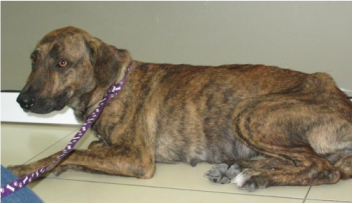 Gracie was emaciated, starving and you could see every bone in her body. Understanding why little children would stand around and physically abuse this young dog as she was dying is something we will never be able to understand. She has so badly beaten, one of her rear legs was broken in several places, and she can never bear weight on it again. For 3 days after her rescue, Gracie could barely move only getting up to eat and for the bathroom. Love and attention was what brought her back to life. 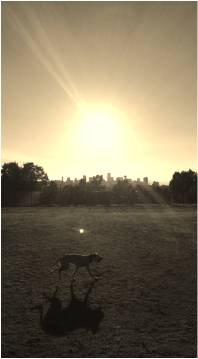 Gracie thrived in her foster home, and eventually found a permanent home in Canada. She did well in her home for years, then suddenly the unexpected happened. When she turned 4, Gracie and her fur sibling were physically attacked in their own yard by two unleashed dogs. Gracie and her sibling sustained mild physical injuries, but it shook Gracie to her core. Her family worked with her, and hired a trainer as Gracie was suddenly living in fear of all other dogs. Unfortunately, because of this, she was unable to return home. Gracie worked with a trainer for the better part of a year. She is now rehabilitated and ready for adoption. 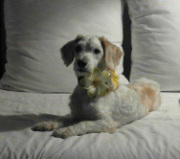 Gracie is now fine with other dogs, but she will need to go to a home where she is the only dog living in the house. She had previously lived with cats with no issues. She's a medium sized dog, weighing in at about 24kg. Gracie deserves a great home where she belongs. Gracie is a master cuddle expert, and has great fondness for people and children of all ages. Do you have room in your home and heart for a great companion? Gracie has been through a lot in her life, please help us find second chance Gracie a permanent place to park her paws. Claudia is always helping. She volunteers her time in various ways with various groups to support her community whenever she can. Her neighbor had rescued a dog and called her Chata. Claudia helped get the beautiful girl healthy and spayed so that she could enjoy her new home. A few months later, the neighbor met another dog and decided that this new dog was the right dog for her. The only issue is that the large male didn’t like Chata and he began to pick on her. Chata was constantly being attacked and was regularly being wounded by the other dog. Claudia knew things were bad and then the neighbor let her know that Chata was no longer wanted in their home. 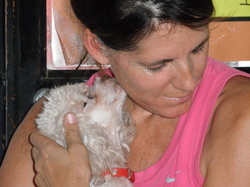 Claudia brought Chata into her home to give her a safe place to recover. Chata is about 1.5 years old and weighs 25 kilos. She is a sweet pup that did well with the other dogs in her foster home, even those that were much smaller, but she needs proper introductions to all new dogs (never a bad idea for any animal). 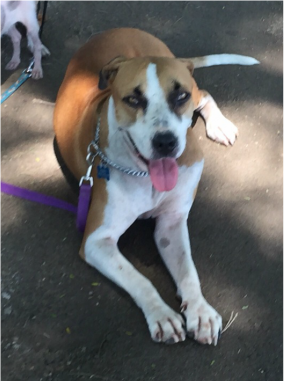 We don’t believe that Chata would do well in a home with cats as she is very focused on them and their movements along with showing prey drive around lizards and other bugs. She loves to play with toys and walks well on a leash. Chata does well with kids and has learned basic commands. This lovely dog is looking for her forever home….one that will make her part of the family and not discard her when a newer model comes around. Please help us to find her family by sharing her story and album! Michelle went for a walk one morning with part of her pack, and a dog started following them. This happens often, but normally it’s only for a block or two. This guy followed them for 40 minutes...all the way back to their house. He sat and waited outside, and was very pleased with himself about the family he just adopted! A random dog, on a random walk, and a random act of kindness all leads to...what else...a dog named RANDOM! Just under a year old, Random is 18kg of pure joy and fun. He is an active dog that will need a forever family who makes sure he gets enough exercise. Random has had a difficult time adjusting to life in Canada, and needs a handler that understands what he needs. Random is great with other dogs with a proper introduction. He needs to trust people before he can be loose with them without his muzzle. Doesn't take him long, hes just really unsure, and to protect all, he needs to wear his muzzle during introductions, and usually if you just ignore him, he will come around. Once you gin his trust, its never broken. 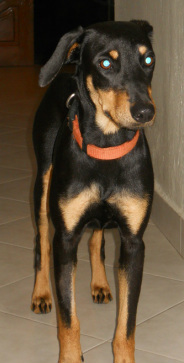 He is a fun loving dog who is eager to please and easy to train. Can you fit a bit of randomness into your life? Brian was out for a walk with his pack when he saw a dog that seemed to be hungry and followed them from a distance. He sat down on the sidewalk with his dogs and gave her a chance to come to them. Although she remained very curious and interested, she would not come within 20 meters. Rather than return home, he walked further to see if she was going to follow. She did but again never came closer than 20 meters. They returned home and she followed. An hour later he went out to see if she was in the area and she was laying by the door. He brought her water and food which she quickly ate. He was reluctant to rescue her because they had a house full of dogs including one with distemper who was not doing well. Several hours later he needed to go to the pharmacy to get some gatorade for the sick pup and she was still outside the door, but would not let him get near her. She followed him 3 blocks to the pharmacy (this time 10 meters behind him) and he tried to ignore her. She waited outside the door of the pharmacy until he left at which time he again ignored her and walked home. He came into the house and gave the sick pup the fluids, then looked out the front door. The old girl was now laying on the sidewalk outside their front door. He invited her into the front yard and she immediately came in and that is when Betty agreed to be rescued. She allowed him to examine her and discovered what seemed like a thousand plus ticks all over her body as well as an old fracture of her right rear leg which gave her difficulty walking around the block. In addition, she had an eye infection and cataracts. Brian started with chore of getting her cleaned up and comfortable. Betty seemed most grateful for the care and attention. 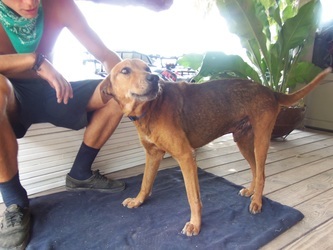 The vet exam revealed that Betty had an old fracture that was never treated, an eye infection, cataracts, tick-borne diseases of Anaplasma and Erlichea, and was determined to be about 11 years old weighing about 30 kilos. Her teeth were almost completely worn out and the vet thought she may have had a previous owner that abandoned her because of her illnesses. They returned home and started her treatments. Betty is perfectly house trained and has never had an accident in the home or even the courtyard. In fact, Brian would take her out for a walk every 5 hours and she would relieve herself within a half block and she would not walk further but instead would lay down on the street until he relented and walked her back to their house. Betty is an old dog and not a good candidate for adoption (we hate saying this, but we know it is true) which means that we will need your help providing for her. 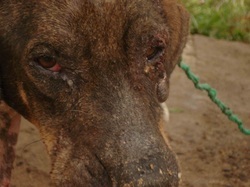 Please consider contributing to our paypal link at www.mexpup.com as that is the only way we can continue to help dogs like her. Betty is good with other dogs and cats. Her eye infection has improved, her nourishment has improved, she is part way through her tick-borne disease treatment, and she is simply a lovely, old dog. She would make a perfect companion for someone who does not want an energetic, demanding dog and will be satisfied with a relatively short relationship with this appreciative senior dog that has a lovely disposition. We would like to find a local home in PV or a family that drives to/from Mexico as we don’t think putting Betty on a flight would be best for her. 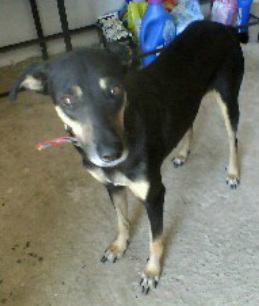 If you would like to adopt Betty or would consider fostering her long-term, please contact patty@mexpup.com. This senior girl deserves a nice, easy, comfortable life and we are committed to making sure she gets just that! ​Days like today are the toughest days. We tried to help, but we were too late. A photo was posted of a dog in bad shape. Many saw the photo, but it was Lupita and Irina that dropped everything and drove across town when no one else did. They found her. She was in really bad shape, but they remained hopeful. She drank some water and laid her head into Irina’s palm. She didn’t want any food. On the way to the vet clinic, they decided to name her Suerte. It was going to be her lucky day. They were determined to help her. The vets knew it was bad as soon as they examined her. She was full of tumors. They were everyplace. Suerte was only 2 years old and hadn’t been spayed. She likely spent lots of time on the streets and that is where she would have gotten the TVT. It spread. It took over her body. She was in so much pain, but she was grateful. Grateful for the gentle touch. Grateful for the kind words. Grateful to be off the streets. Her bloodwork showed us what we already knew. She was too far gone. There was almost no blood in her system and things were failing. The three of us stroked her, held her, talked to her and helped her to pass. It wasn’t what we wanted, but it was the kindest thing we could do for her. Suerte suffered because of indifference. If she had only be spayed, she may have been spared. She will always remind me why spay & neuter is the most important thing we do. It is the solution. It is the way to end suffering. Please consider donating to MexPup or Peace Animals (who run a weekly free spay & neuter program in PV and the surrounding areas - www.peaceanimals.org) in the name of Suerte. The more resources put towards free spay & neuter clinics, the more we can reduce the suffering of animals like this beautiful girl. ​We don’t know how she ended up at the acopio, but she was there. We had an available foster home, so we pulled this cute little girl with the plan to get her healthy and ready for adoption. The first stop, as always, was the vets, so she could be tested and start her care. That’s when we got the bad news. Mitzy was positive for distemper. She only had a slight cough, so we had caught the illness early and moved quickly to get her the treatment she needed. The call was made to Puebla where they have the special medication that can help fight this horrible virus. Mitzy is about 10 months old and weighs about 4 kilos, so her body needed all the help it could get to battle the disease. The medication arrived the following day, the shot was given, and we hoped for the best. After one week in care, Mitzy seemed to be stable and she was moved to her foster home where Pat & Kip could provide her the one on one care she needed. This morning, things took a turn for the worse. The disease has now progressed to her nervous system. She is back at the vets and we are asking for your help. Please keep Mitzy in your thoughts, prayers, send her energy…she needs our help. It is with a heavy heart that we make this post. Mitzy has crossed the rainbow bridge this morning. She was a sweet, playful, adorable pup who fought so hard, but the distemper simply wouldn't let go. Her loving foster parents Kip and Pat gave her a wonderful home and made sure that she knew love in her final weeks. Rest now sweet Mitzy, you fought so hard and we are so sad you are gone. Update 4/14/2015: Yesterday, Andrea started to take a turn for the worst. She didn't want to eat or drink and some of her body function began to slide. We sat with her. We loved her. We told her that we would be there for her and we asked her to keep fighting if she could. This morning Andrea's body gave up the flight. She had done all that she could and it was now time to rest. We are all heartbroken for the suffering she endured. We are also grateful that her final days were spent with love, kindness, care, food, water, comfort. Run free over the rainbow bridge sweet girl. Even after such a short time with us, you will be so very greatly missed. ​The plan for today was to have a nice lunch. Everything changed when a photo came up on FB that inspired immediate action. A dog needed help. Desperately needed help. So off we went to try and find her. We had basic coordinates but weren't sure exactly where she would be. So, we asked around and many of the neighbors helped us to find her. We named her Andrea, after Mexpup Andy who crossed the rainbow bridge a few days ago. She tested negative for distemper. She is painfully thin, has mange, has an infection in her mouth, and numerous puncture wounds on her head (most likely from another animal). We are letting her rest a bit before doing additional tests (kidney function is a major concern). She ate a bit of AD canned food and drank a bit of water - both great signs. Tonight she is sleeping in a safe place with a full belly where she can begin to heal. 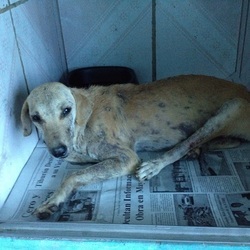 If anyone would like to make a donation to her care, you will find the paypal link at www.mexpup.com, in Canada you can do an email $ transfer to Karen@mexpup.com or you can drop off a donation at Mascotas vet clinic in the name of Andrea. We can only help dogs like Andrea because of your support. Thank you for helping us to help her. 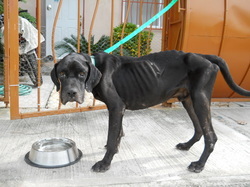 Lupe was brought into care a few weeks ago, very underweight and in need of help. Louise saw her on the street, and took action. She called to get advice, assistance and direction, but she was the one that was with Lupe every step of the way, providing her with the love, care and attention she needed. This beautiful pup was blossoming in care. 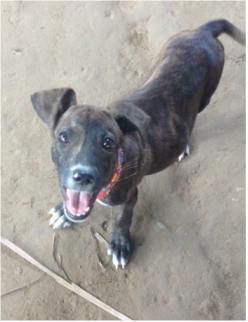 Lupe was learning commands, playing with toys and loving life in a home. Her personality was starting to show, and she was proving to be a funny, playful girl. She even had a wonderful day at the beach….Lupe was so far from where she was when she was rescued. Yesterday we received the sad news that Lupe passed away during surgery. She knew love and knew what it felt like to be a member of Louise's family and the MexPup family. Although Lupe was only with us for a short time, she was dearly loved and we will miss her. Our hearts go out to Louise at this time. Louise, we thank-you for everything you have done, and so does Lupe. RIP October 23, 2014 - While walking around in the yard this afternoon, Charlotte laid down, took a deep breath and then she passed away. Although the vets made it clear that this day was coming, we continued to hope that she would have more good days filled with love and care and comfort. We know that her short life was very hard, but are grateful that while in care she was the Queen. She had many good days and seemed truly grateful for what she was given. Charlotte was a lovely dog that deserved better. Run free now sweet pup.....you will be missed. original post: When it rains it pours........Ted & Brischa were driving along last night and saw what looked to be a beyond pregnant female. She was on the side of the road. When they stopped to take a look, they asked around and were told that someone had driven by and tossed her out of the back of a pick up truck (#$*#*^@). Sickening is the only word I can write as we try to keep our language appropriate. So, with no plan, no place to put her (they recently took in 4 foster dogs and have 7 dogs of their own), and limited resources, they picked her up and took her home. We got an email asking if there was anyway we could help. Well, Ted & Brischa both work and they still manage to find time to help all the animals in need that fall into their paths. We simply had to find a way to help. So, we said yes and joined them in the journey of Charlotte. We are here with no plan and limited resources, but we are committed to helping her. Well, she went to the vets today for a check up and to find out how many puppies would be arriving in the next days. We got the amazing news that she wasn't pregnant. This girl is sick, her kidneys are not functioning and she is retaining more fluid than any of us can imagine. The great news is that although she looks horrible and is in pain, her prognosis is good. 1.5 liters of fluid was drained from her today and she has been started on medication. With time and care, she could make a full recovery. Can you please help us to help Charlotte? 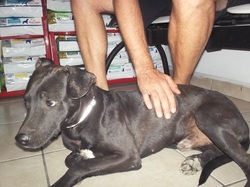 We really need a foster home in Puerto Vallarta, Mexico where she can recover and get the love and care she needs. She must be in considerable pain, but she has been loving and welcoming with all the humans and dogs she has meet. Charlotte is approximately 1.5 years old and weighs 21 kilos (her weight will continue to drop as the liquid retention is fixed). She is a medium sized dog and needs a place to recover (or funds to cover boarding until a place can be found). Please help Charlotte......her old family discarded her and we vow to never let that happen again. Luna was born into a not so promising future. Out of all the dogs in Mexico, you could say she was hand picked by fate. 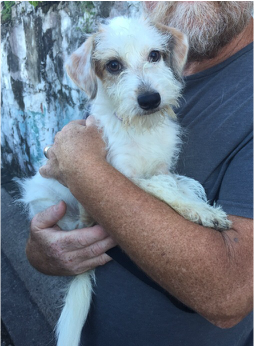 A caring, compassionate stranger took concern upon the skinny, flea ridden puppy and got her to safety and provided clean water, food, shelter and love. Luna was very fortunate to experience love in her life, as so many others still wait for the opportunity, and some may even never get the chance to know how truly wonderful the human race can be. Luna was lucky enough to know compassion, to know love. Fate really valued Luna, and for her short time here on earth, Luna got to experience so much of it. 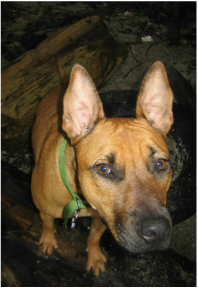 Luna was playful, excelled at agility and was as smart as a whip. She was adopted by a wonderful family where she was shown how wonderful life can be like. Trinity, Luna's mum says "Luna was a very smart girl. She was constantly figuring out ways to out smart me. She mastered how to open my door so that she could run around in the woods and chase birds and deer. When we did agility, the instructor was always amazed with how fast her brain works and told me I need to speed up in order to keep her interested! We walked and ran in the woods everyday! Her favorite hike was straight up a mountain, we were always alone in the trail, and it met up with a running stream many times. Luna liked the freshest water possible! She loved to dig her nose under your arm or leg when sleeping or resting. She loved to kiss everyone. And constantly warmed the hearts of myself and the people around me. She was the sweetest dog. And I'll love her forever!" Sadly Luna developed a very rare and aggressive form of cancer. This sweet girl didn't have nearly as much time as she deserved with her family as everyone hoped. But she did have a wonderful life full of love and care. Safely, she passed away on December 26, 2014 in the loving care of her new family. When Trinity had adopted Luna, we conducted an interview to find out how Luna was settling in. Trinity explained to me that she thought she was going to change Luna, a rescues life, and instead, Luna's changed hers. The important lesson Luna taught Trinity was that having a pet isn't about just what the human need anymore, It's a relationship, a special unbreakable bond. And even in passing and through the ages, that bond will always remain. It was a very sad night. Claudia & Carmen were walking their own dogs along with their foster dog River when they heard a noise coming out of a planter next to a store. They found a black and brown female dachshund that was having convulsions, was crying out and they could tell she was suffering. They took their dogs home and returned for the pup. They weren’t sure what to do, but knew they needed help so Carmen started calling all the animal emergency numbers she could find. Eventually they connected with Dr. Francisco at Juniors Vets in Pitillal. Sadly it was determined that Lovely had severe neurological damage, was suffering and there was little that could be done other than helping her to pass in a kind place surrounded by love. This one and a half year old dog had a home, was not well looked after and the owners decided to dump her in this state to die on the streets. Some days I really don’t like people very much.....but then I realize that as horrible as the family was to this dog, Carmen & Claudia were also there and they made a difference. Lovely might not have gotten the result that we want, but she certainly was saved from additional suffering. A decision had to be made and the most humane was to put Lovely out of her suffering and have a pain free death at the vet’s office. Carmen and Claudia were back home by 2.30 AM, holding their dogs close and trying to sleep after this sad, painful experience. meet again. Peanut was rescued from the streets.....a sad, skinny, dirty pup. 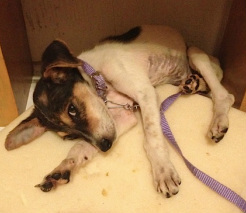 At just a few kilos and a few months old, life on the streets wasn't easy for her. Thankfully, she met Carmen & Claudia. They welcomed her into their home and their pack. The plan was to foster her until she was ready for adoption. Sadly, the horrible illness distemper entered her body and although they fought as hard as they could, the time came to let Peanut go. She was a good girl, playful, funny and super loving. She was loved back and had a dignified peaceful death. May she rest in peace. Alba had a home, but not really. They say that there were owners, they say there was a family, but no one knows who they are. Alba was always walking the streets…looking for food or water or shelter or maybe just companionship. Alba was a dog that lived in that grey área – she was supposed to have a family, but she was really on her own. One day while on the road, she was hit by a car. Who came to her side, her family? No, it wasn’t them. It was Karla, a compassionate person that is always doing what she can for the animals that need help in her small town. She took her in and got her to the vets. They were hopeful that she was going to be ok with the basic treatments available when there are few resources and fewer funds. Alba didn’t improve as hoped. More tests were needed and Karla reached out to MexPup for help. We don’t know what the future will hold for Alba, but what we do know is that she will no longer be on her own. 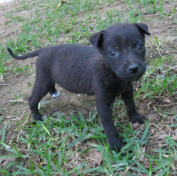 She is now part of the MexPup family and we will be there to make sure she gets tests, treatment and the care she needs. We are hopeful that the vets can determine what is causing the problems and that there is a solution. We will be there with Alba and we will fight on her behalf because she deserves that. We hope the day will come that she will be looking for a real family that will love her and cherish her and value her. For now, we will ask for your support. We need funds to continue to help dogs like Alba……those that without compassionate people would be left on the side of the road to suffer and die. We depend on the MexPup family to step up for dogs like Alba who deserve much better than they have gotten. Alba had been slowly but surely declining and after a long conversation with Dr. Paco and much consideration, the decision was made to end her suffering and to help her cross over the rainbow bridge. This isn't the ending that we wanted for this sweet girl, but she was surrounded by love and we told her how many people cared for her. Thank you to Claudia and Karla for all that they did for this lovely pup. Rest now Alba, you will suffer no more. This dog needed help, of that there was no question. Thankfully, Danilo, Leslie GT and Luna Castro all came together to help. First, they had to convince her family that she was very ill and needed immediate attention. Once they had her, they asked Mona & Brian for help....this poor little girl certainly needed it. 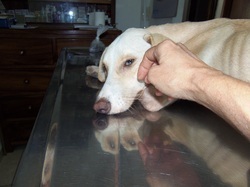 They got her into the loving care of Dr. Pena and staff at Veterinaria Mascotas Puerto Vallarta. Aurora was a very sick puppy with severe, non-contagious sarna (mange) in addition to being totally covered in ticks and having both Ehrlichia & Anaplasma. Because her skin was almost falling off her in places, they could not give her a flea/tick bath so treated her with medication to free her of them. Aurora is estimated to be about 10 months old and weighs about 8 kgs. At first, she was s a very sad little girl and would not come to us, but faced away from us in her kennel. After a few days in care, she would sit at her kennel door and look out at the movement around her. Aurora enjoyed scratches around her face and learned quickly that the human touch could be kind & gentle. We are sad to report that Aurora passed away on May 28, 2014. The combination of her mange and parasite infestation was too much for her depressed immune system. Rest in peace dear Aurora. Andres noticed a cute puppy playing with her owners by the docks where he takes a boat to work. Small, playful, healthy puppy. But that didn't last. As puppies do...she grew. And as irresponsible owners do, they got bored when they realized that puppies don't stay puppies, and they abandoned her. Andres lost track of Daisy for awhile (presumably she hid somewhere having a litter of puppies). When he finally saw her again she was incredibly thin. He asked a fellow dog rescuing friend, Karla (from Boca Divers) to help feed her and watch out for her until they could make a better plan. One day when Karla went to feed Daisy, she couldn't find her. After asking around the neighborhood Karla was led back to the docks that Daisy knew so well, and found her curled up, sick with a severe uterus infection, dehydrated and near death. Karla didn't think twice and scooped up Daisy, phoned Andres they brought her to the vet immediately. The damage to Daisy's body from the neglect she suffered was just too great. She fought hard, but her body was simply too tired. This sweet girl crossed over the rainbow bridge.. She knew love and we are grateful for all that her foster mom Brenda did for her. Run free now Daisy, you touched many hearts and we will miss you. On Christmas Eve, Virna and her husband Diego were on their way to a wonderful Christmas dinner. They dressed up and headed out for a lovely evening. On their way they passed a dog sitting in the middle of the road. They drove by, thinking it was strange that the dog didn't move. They didn't even get down the street before they decided to stop and check why the dog didn't move out of the way. Good thing they stopped. When they approached Betty they noticed that she was scared and blind. They carefully and lovingly scooped her up and took her home with them. As Virna said, "I pictured myself going back to the car and off to a warm and friendly dinner party, xmas hugs ... and leaving her there was heartbreaking..." So they made a difference and performed a Christmas miracle of their own. 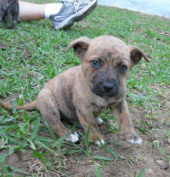 Mardi Gras was a very special boy that came into MexPup's care in February. When he was found, he had parvo, was emaciated, and had very limited sight. Although Mardi had only met a handful of MexPup supporters, his story has touched the lives of hundreds of people. Despite being blind, and once discarded, Mardi loved and trusted humans. He was an energetic and happy pup, and he lived in the moment. He has shown us that life is not eternal, and not to be taken for granted. Mardi lost his battle to a congenital defect in his brain in May 2013. Although he was not long for this world, he knew love, care, and kindness. He left this world not alone on the street, but in the warmth of loving arms. You're now free Mardi, free to run across those sandy beaches, taking in the sights, sounds and smells of the ocean without knowing limitations. Rest in peace Mardi, your story, your zest for life, and bravery will never be forgotten. It is with a heavy heart that we share the news of Melony's crossing over on Feb 28, 2013.
care these past weeks. She knew love and didn’t suffer…..tears for Melony. There is nothing worse than seeing an animal in real distress on the street. You know they are in pain, you know they are scared, and you know they are in trouble. Some people don’t see them, some people see them and continue on without a thought, some people see them and wish there was something they could do but they do nothing, and then there are AMAZING people who take action. I am proud to know many such amazing people and am grateful for all they do. On Saturday afternoon Mar was with a group of friends and they had plans, but when they saw a dog in great need they dropped everything and made a difference. Lucy was on the side of the road and they could see she had an obvious problem with a mass of tissue and probable infection between her rear legs. They turned the car around, pulled up near her and got out of the car. The smell was incredible! This girl was clearly in trouble, so they got her in the car and immediately went to a vet clinic. There was no plan, there were no easy answers, but there was no doubt that they would do all they could for her. Emergency surgery was performed that day and the vet said that she did well during the procedure (she had likely suffered a trauma which injured tissue in her vaginal area which became infected and then much of the tissue started to die). 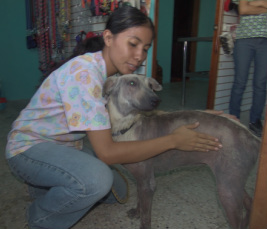 Two days after surgery, she was moved to Mascotas vet clinic so that she was close to town and with vets that could provide follow up in clinic care. We hoped for the best, but sadly the damage was far to great for Lucy. On February 16, we helped Lucy cross over. Dr Peña went to her foster home so that she could be in her home, where she was loved. Her final days were filled with extra treats (the bacon ones she loved so much), scrambled eggs in her kibble and lots of love. She was spending more and more time in her safe spot, her crate, as the tumor continued to grow, bringing added discomfort and pain. She left us surrounded by those that loved & cared for her. She was safe and is finally without pain running free over the rainbow bridge. Living on the street must be hard. Being born on the street is a totally different struggle. Preciosa was one of Sugar's puppies. We don't know how many littermates she had because she was the only one that was able to survive until she and her mom were rescued. Sugar did a great job trying to keep her babies alive, but sometimes the challenge is just too great. When Sugar and Preciosa were found digging in the garbage for food, their rescuer Nicole knew she had to do something quickly. She rushed them to the vet and they stayed in intensive care for 2 weeks. Although her mom got stronger and healthier as time went on, Preciosa was just too weak. After 2 weeks she was sent over the rainbow bridge where she is now free of worries and pain. Thanks to Nicole, she was able to spend the last weeks of her life safe, warm and fed. We are grateful she knew love and care. These are the stories that we hate to tell, but they are part of the reality of animal rescue. You may not want to look at these photos, but I am including them because this dog deserves to be remembered – their suffering pushes us to continue helping through the tears. 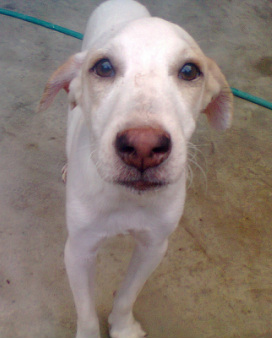 I am grateful to Julie and Domingo for seeing Manchas, for calling us and for offering to help him. This is the hardest part of rescue, seeing an animal who has a home and yet is treated with such complete indifference and cruelty. It is sickening. Sadly, the vet confirmed that it was way too late to do anything but end his suffering…..but that is something. He got a gentle touch, a bit of care, love from a good human and release from pain that he didn’t deserve. We are sorry we couldn’t do more for him, but we are glad that he is now in a place where he is free from all that hurt him during his time on earth. Run free Manchas, you are a great dog that deserved so much more. There is no easy way to share this. Makaio is gone. She was at the park, there was an accident and she was killed. She was hit by a car. The vet says that she didn't suffer. We are devastated by the news. We are sad for everyone. We know accidents happen and we can't control everything. We wish the ending for this sweet girl was different, but are trying to hold on to the fact that she was healthy, happy and playing when she left this world. Rest in Peace Makaio, you will be missed. Duke decided that he found someone who loves him and that was all he needed. He had 18 hours of love, compassion and care. He was in a home when he passed away in Andres's arms. Andres did everything he could, was in touch with Dr. Paco, gave him CPR but Duke was ready to rest. He will be cremated and will have his forever home with Michelle & Andres. We so wish we could have done more for Duke, but he knew he was loved in the end and we are grateful for that. Violet had been a MexPup for only 2 months, but she made such an impact on all of us in that short time. We gently sent her on her way. She was cuddled in my lap for the better part of an hour as we said goodbye. I gave her some wonderful chicken as she loved to eat, a belly rub from Paul & Robyn, told her how Stephanie always bragged about how beautiful she was, that someone had put in an application to adopt her as their very own, I let her know that Mona's Aunt Sally would be there for her and I told her that the other MexPups would be there to make sure she knew she was safe. I told her how proud we all were of the fight that she put up, but that it was now time for her to rest. She was a fighter that overcame many obstacles, but recently the fight began to really take its toll on her. In the past few days, she had slid dramatically downward as a new illness attacked her and we knew that as much as she wanted to please us, her body simply wasn't able to win this fight. We are grateful to Veronica who had not only been Violet's doctor, she had also become her foster mom. Violet knew Veronica loved her and Veronica loved Violet. We were with her to the end and she knew she was loved. Marco was a tiny pup that was rescued by Claudia one week ago. She took him in off the streets and we did all that we could to help this little guy. Sadly after 6 days, the vets told us that he was not responding to treatment, was getting worse, and was in a lot of pain. They told us it was time. We always want to do what is the best for the animal, no matter how hard it might be for us, so on Friday afternoon the vets peacefully put Marco down. We are thankful that he knew love, care and shelter for a week. It isn’t enough and he deserved so much more, but we did what we could for him. 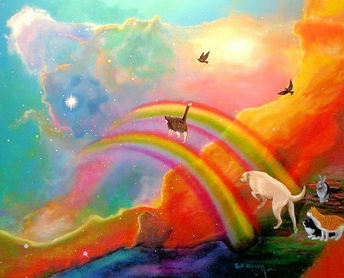 Run free now Marco over the rainbow bridge where you will suffer no more. Rest in peace Rooster: We try very hard to do the best for all the animals we take in. In the case of Rooster, we have failed him. His foster dad made the decision to have him put down. He did this without consulting the vet that has provided his care for Rooster all these months he has been in foster and without consulting anyone from MexPup. We did receive an email last week saying there had been a fight between two dogs and that someone had been bit in the process. He told us in the email that he planned to have Rooster put down. We were not given many details, but we believe he was bit while breaking up the dogs. We were out of town, but immediately replied that we would take him. We told him NOT to kill this pup and that we would get him immediately. We set up a location with a trainer where Rooster could go and we only needed the foster dad to respond to our attempts to contact him. He did not reply to us. He is fine, but Rooster paid the ultimate price. His response to this situation was to take Rooster to the acopio to see the vet there and have him killed. I cannot express how horrible I feel. I know that I let Rooster down and for this I will always be sorry. I do not know how someone that has fostered numerous dogs makes this very serious decision without speaking with others and considering every option available. There is nothing more to say except that I hope Rooster knows that we wanted so much more for him – today I will grieve. 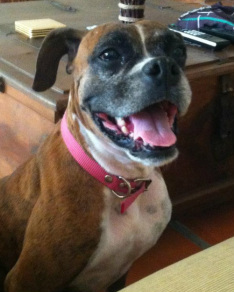 On May 5th, 2012, we helped Roxy to cross over the rainbow bridge. She seemed to be responding well to the treatment for her tumor, but as soon as the series of chemos ended, the tumor came back quickly & as large as ever. Her energy fell, her cough got worse and the vets told us it was time to let her go. We are so grateful that this sweet girl got to have 2.5 months of love and care in 2 wonderful foster homes. Ian & Martha made sure that she knew she was part of their family and Roger pampered her like the princess she was. She was safe, she was loved and she knew kindness. It is so hard to say goodbye, but we know that she is now without pain and running free. Sometimes it hurts so much even when you don’t know the dog. By the photos, I can tell she had been in pain for days and yet it took a wonderful couple who were strangers, to offer her help (she lived at a home with a family that saw her daily and did nothing). Sadly, it was too late to do anything but help her die in peace surrounded by love. We are thankful that she was spared more suffering. Preciosa – We are sorry we didn’t find you earlier, but we are glad that you knew you were not alone and that you felt love & compassion at the end Cross over the Rainbow Bridge to a place without pain, cruelty or suffering. Run free, sweet girl, you are free. 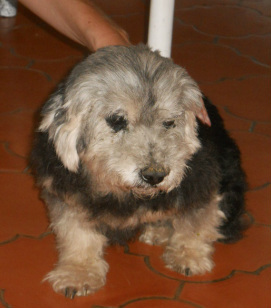 Barbara was (in the animal rescue world) the saddest type of case there is, a homeless, old and pregnant dog. We got her off the street and into a foster home with the hope of giving the best chance for survival to all of her puppies. She delivered a litter of 13 puppies and sadly, 5 of them didn’t make it. 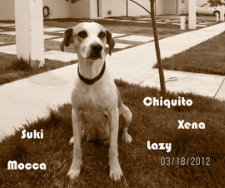 We lost Chiquito, Xena, Lazy, Suki and Mocca. They were all buried under a tree where their foster moms can visit them. They were amazing and beautiful puppies. We were heartbroken to lose them but are thankful that 8 of their littermates made it. Shaggy DA was at the PV acopio a high kill shelter. Since the city has pulled almost all funding & there is no longer a vet, the rate of distemper has skyrocketed. There is no one to screen the animals and the few workers are doing the best they can. We know it is dangerous & we tried to give him a second chance at life, but we simply got him out too late. He tested positive for moquillo & was sent over the rainbow bridge. RIP Shaggy DA, you were a great dog and deserved much more. 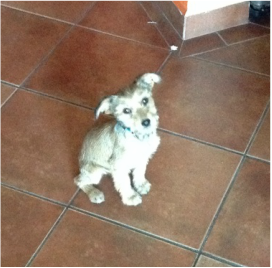 Pancho was hit by a car on Sept 17th in front of Carmen & Claudia's apt. They heard a thud & then very loud crying. Thankfully for Pancho they were there to hear it, found him & got him into a vet's care immediately. He was stabilized and then prep'd for surgery. He suffered internal injuries, had lots of bleeding and a number of fractures. He made it through the surgery to deal with the internal injuries & through the first night - the vet told us "he is a fighter and wants to live". Sadly, the internal injuries combined with the damage to his pelvis were just too much. I am thankful that he knew he was loved & cared for in his distress and that he did not die alone on the street Rest in Peace sweet boy. Patas had suffered at the hands of horrible people. Someone did a partial amputation of his left rear leg and put him out on the street with bones exposed. What kind of person can do that? I am stunned by the cruelty & equally amazed at how sweet & loving this little guy is. He was lucky that some caring people saw him on the street & got him to Sabuesos. They operated immediately, fully amputed the leg & gave him a chance at a wonderful life. He was walking on his 3 legs the day after surgery. Bopped around the clinic and gave love, cuddles & kisses to anyone that he found. He was approximately 7-9 months old and weighed maybe 2.5 kilos. He remained at the vet's office following the operation and although he was given wonderful care, he was unable to recover from all the damage done to him. He has crossed over the rainbow bridge where he will be able to run freely and needs not fear humans. You suffered too much in your short life, but in your last weeks you were given and gave great love.........Patas, we miss you. 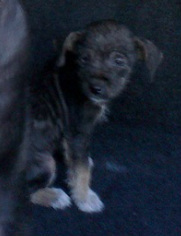 Ari was hanging out in front of Home Depot in PV, alone and when Tere left the store he followed her right to her car. That tells you how smart this boy is. He knew his savior when she arrived and just waited for the chance to make sure that she knew it too. 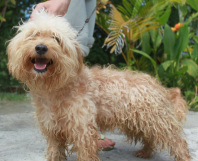 Sadly, Ari contracted distemper and went over the rainbow bridge with mercy. We will miss you Ari - you were a good dog! Lucy was only with us for 2 weeks. She contracted Parvo and although she fought so hard, she was unable to fight off the virus. She died in our arms, she knew she was loved, and we will always remember her. Chewy was taken from us after just 1 week. Sadly he had gotten Parvo while at the high kill animal shelter in PV. For the days he was with us he knew love, comfort & safety. He will always be remembered. We found Canela suffering on the street, she wasn't even moving when cars approached. We took her in for the night, gave her a bed and food. She wouldn't drink. We took her to Dr. Paco first thing and he was shocked with what he found. Her internal infection was the worst he had ever seen, her kidneys were already failing and he said the kindest thing to do was to take her out of her pain. He administered the first drug and she passed quickly. We never got a picture of her and that still makes me cry. I wish we had found her sooner.